Things have sure been busy here lately.... invitations orders have been nonstop, school has been crazy and we are selling our house and searching for a new one. I haven't had time to stop by the blog lately, but I did get a little time tonight to do a little creating. At Christmas while I was searching for what I wanted I started researching Copic markers. 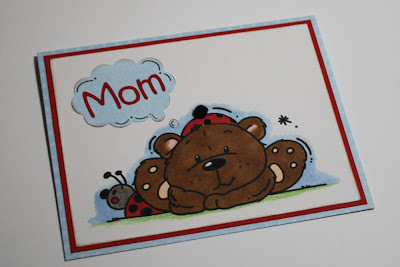 I don't do a whole lot of stamping and coloring, but there are so many beautiful cards out there using Copics that I decided to give it a try. I purchased a handful of markers and beginners book with some Christmas money, and they have been sitting on my craft table ever since. Tonight I decided it was high time I gave them a try. 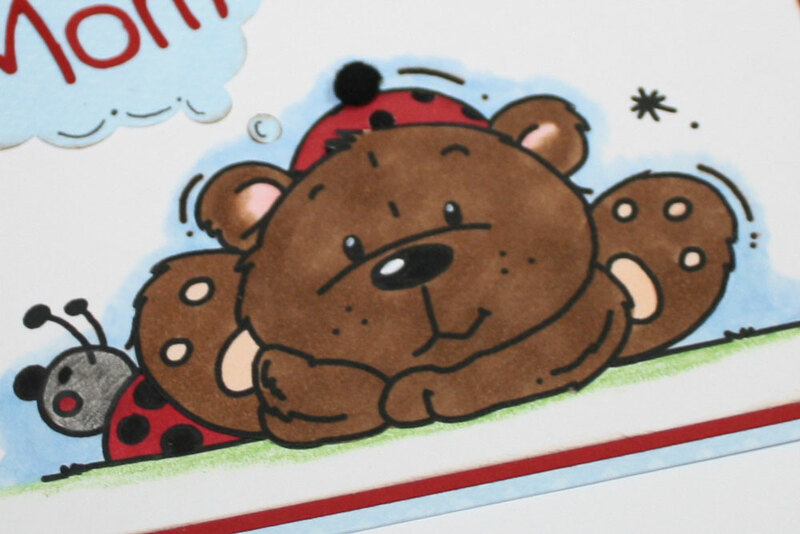 I first found this adorable little bear image on Bugaboo Digi Stamps. I just love that little face and sweet little ladybug. To make it even better it was their Freebie Friday design. Awesome!! As I worked on the card design I knew it had to have layering and some kind of diecut. I started by printing the image twice. On the first one I colored the bear and carefully cut him out. I then colored the background, ladybug, and grass on the second printout. The little hat was cut from patterned paper and colored to match the ladybug. It was attached on top of the orginal hat design with a little pompom at the top then the bear cutout was attached on top of it all. With Mother's day coming soon I thought it would be sweet to make this a Mother's day card. That's where the diecut comes in. The bear design looks so deep in thought... what could he be thinking of? How about Mom? I still have a long way to go with the Copics, but at least I tried them out. I think he turned out pretty good for a first time. Whoa - that was your first time with copics? You did an AWESOME job, your card is adorable!! !